Recent cases, such as the one John Patzakis blogged about last week and the case in Michigan where Facebook content led to the arrest of child-beaters, have put social discovery squarely in the spotlight. While there are those in the industry that still think of social media as being a fringe element in the eDiscovery world, the evidence suggests otherwise. The fact is that social media content is an integral part of business life. 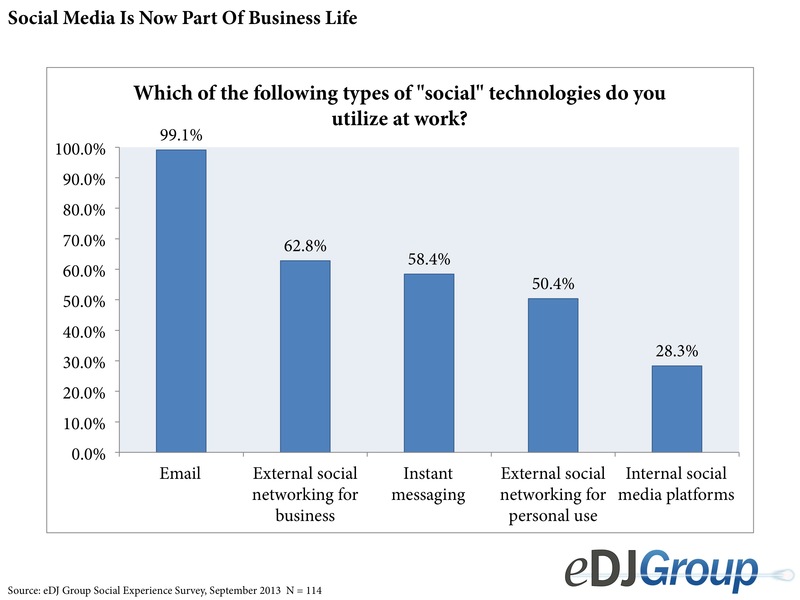 eDJ Group research from last fall shows that 63% of eDJ’s survey respondents use external social media such as Twitter, LinkedIn, or Facebook for business purposes. In fact, usage of social media for business is growing and it will soon catch up to (and probably surpass) email. We all know what happened with discovery of email – the inability to efficiently collect it practically created the eDiscovery industry. Reinforcing the fact that social discovery has arrived are the sales numbers for X1’s social discovery product – which continue to grow exponentially – and word from service providers that they are doing Facebook collections thirty times per week. I believe that social discovery is poised to become a big market in and of itself. The challenge with social media – unlike email – is that much of the data resides outside the walls of an organization. Collection of social media becomes a challenge. Companies cannot simply call Facebook or Twitter and request all of the information for various custodians. It is possible to take screenshots of various web pages or social media sits, but as John’s blog points out, screenshots are not necessarily admissible as evidence. Plus, screenshots take a technical toll on eDiscovery – they can be difficult to index and may require OCR, which still may not be able to pull text out of the image. Companies could write API connections to the social media publishers themselves, but that requires a ton of labor to not only build those connectors, but also to manage the almost weekly updates to the publishers’ APIs. Instead, companies should look for an investigative platform. Tight API connections to the major social media publishers like Facebook, LinkedIn, Twitter, and Instagram. The API connection allows for the capture of unique metadata that each publisher adds to its data. A web crawler and capture capability that creates a copy of the page to be stored for processing into a preservation repository. The ability to keep data forensically sound. This requires calculating MD5 hash values of individual items upon capture and maintaining those values through export. The platform must keep logs and reports of all actions on data. It also must be able to use metadata to establish chain of custody and authentication. One of the points eDJ Group makes in its “Collection of Preservation of Social Media” report is to “[p]lan for more and more social media. While companies can focus near-term efforts on the major publishers (Facebook, LinkedIn, Twitter), over time there will be more and more sources of social media for companies to govern. The number of users of other social networks like Google+ and Tumblr continues to increase. More and more companies share video content via YouTube. And, just imagine the rich evidence that a site like FourSquare (which allows users to check in with their geographic location) could provide.” Social discovery is here to stay and the stakes are getting higher. The time to act and build the capability is now, not a year from now when you are already behind the eight-ball – that will only create the same situation we created by getting behind the curve with email.